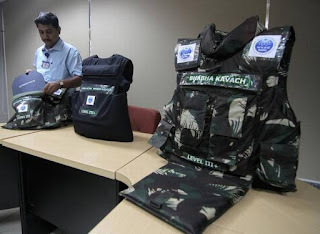 The Bhabha Atomic Research Centre (BARC) has developed Bhabha Kavach, a next-generation bulletproof jacket for the Indian armed forces. Bhabha Kavach has been named after nuclear physicist Dr Homi J. Bhabha. It was developed at BARC’s Trombay centre in response to a request from the Central Reserve Police Force (CRPF) and the Ministry of Home Affairs. The bulletproof jacket is not only cheaper but also much lighter. It weighs just 6.6 kg in comparison to the 17-kg jackets in use, and has passed over 30 tests carried out by certified agencies. The materials used in it reduce weight by nearly 50% as compared to presently used heavy steel-armoured jackets that weigh between 10kg to 17kg. Bhabha Kavach is available in three variants as per the requirement of the armed forces. The jacket is made using extremely hard boron carbide ceramics that is hot-pressed with carbon nano-tubes and composite polymer. Boron carbide is being used by BARC in the control rods of its nuclear reactors. It is very cost effective. While the cost of a Bhabha Kavach is ₹70,000, jackets of similar strength are available in the range of ₹1.5 lakh and have to be imported. Bhabha Kavach is able to withstand eight 7.62mm bullets fired from AK-47 rifle from distance of 5-10 metres. It can even withstand 5.56mm bullet of Indian Small Arms System (INSAS). The jacket was developed by a team of 5 members who worked for a year. It is being now tested by a joint team of the CRPF, Indo-Tibetan Border Police, and the Central Industrial Security Force. The northern command of Indian Army is also testing variant of jacket in Jammu & Kashmir. If jackets pass various tests, it will be manufactured by Mishra Dhatu Nigam Limited, a defence public sector unit. The BARC (Bhabha Atomic Research Centre) is India’s premier nuclear research facility based in Mumbai, Maharashtra. Dr Bhabha established the Atomic Energy Establishment, Trombay (AEET) in January 1954 for multidisciplinary research program essential for the ambitious nuclear program of India. After the sad demise of Bhabha in 1966, AEET was renamed Bhabha Atomic Research Centre (BARC). BARC is a multi-disciplinary research centre with extensive infrastructure for advanced research and development covering the entire spectrum of nuclear science, engineering and related areas. At present, K N Vyas is the Director of BARC.